There are a number of ways that you can complement your child’s learning at home, even in the early years of their education. Helping with homework is a more obvious method for older children who have structured homework, but there are plenty of opportunities in everyday situations for you to boost a young child’s education at home. It is important to realise that learning should be, and can be, fun for younger children. Wherever possible you should encourage children to learn for themselves, rather than trying to pressure them to learn in too structured a way as this may prove counter-productive. There is no doubt that reading with your child is extremely beneficial in helping them learn to recognise words, and many schools actively promote reading at home in home-school agreements. These home-school agreements often recommend that parents read to their children on a regular basis and encourage teaching your child a love of books. Joining the local library and letting your child choose their own books will help them too. Helping your child learn to read isn’t just about books, and there are lots of ways that you can encourage them to read. It is important to make this learning experience as much fun as possible, and making up games around words and letters is a great way to achieve this. For example, you could ask your child to spot the letters of their name while they are out and about. The possibilities are endless with car number plates, road signs, shop displays and more. Of course, there are educational computer games and other interactive toys available to help make learning to read more enjoyable. Magnetic letters are great for making words together on the fridge, or other surfaces, and there are even special foam letters that can be used in the bath for some additional learning fun while they wash! Many schools ask children to bring in items that begin with a particular letter when they are first learning to read. This is a great way to let your child explore the names of objects and you should encourage them to help you pick an item, and be as creative as you can. Picture dictionaries are a great way to start recognising what begins with a particular letter. The only sure way for a child to learn to write is to practice. It is important for you to encourage your child as much as possible to practice writing letters and words and to praise them when they do well. A lot of concentration is needed in the beginning, so try to let your child work in small amounts at a time. They may get frustrated easily, but gentle encouragement and positive comments will help them to keep trying. 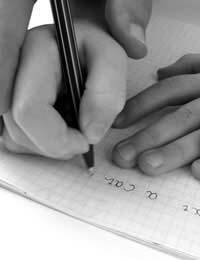 As they get more confident with their writing you may find that they want to practice a lot on their own. Take advantage of birthdays and Christmas, for example, and let them help write some of the cards. Of course, writing their name on each piece of artwork they produce is also giving them more practice. Numbers are all around us, and you can take advantage of this to help your child with their learning. No matter what you are doing, you can nearly always find a way to introduce numbers into it. Whether it is showing your child their age for their next birthday, asking them what number the hands are pointing to on a clock, or getting them to count how many birds they can see in the garden, almost every activity can be turned into a learning experience. As your child becomes more confident with numbers you can teach them to write your home or mobile telephone number, which is invaluable in emergencies. You can also introduce basic maths problems in everyday situations too. For example, asking them how many pieces of apple are left after they have eaten a couple, or how many more cups you need to get out at tea time. There is no doubt that children learn more effectively if they are having fun. You can encourage your child’s love of learning by inventing games and introducing learning into everyday situations. This boosts your child’s development, and allows you to be more involved in the process.